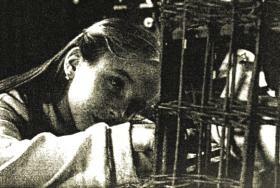 Fly, be free: Louise (Simon) forms a bond with the neighbour's prize pigeon Napoleon. Review by Rich Cline Lush black and white cinematography gives The Carriers Are Waiting a timeless, ethereal quality, highlighting the film's universal themes and showcasing its remarkable performances. This is a family drama--and it features plenty of dysfunction!--but it's essentially about how a sense of love and belonging holds us together no matter who we are or what we do. Roger (Poelvoorde) is a demanding man whose hot temper has left him working from home as a freelance news photographer. Pushy, exhausting and sometimes maybe dangerous, Roger has made everyone around him nervous. His wife (Baeyens) waits for his next outburst to ruin the day. His 16-year-old son (Devigne) is badgered into participating in a world-record attempt even though he'd rather be out wooing Jocelyne (Lacroix). And his daughter (Simon) turns to the skittish pigeon-raising neighbour (Grand'Henry) for friendship. But despite all this, there's a sense of love and loyalty that holds everyone together. The carrier pigeon metaphor is a gentle undercurrent to more intense themes about guilt, compassion and, especially, parental influence and expectations. Poelvoorde is astonishingly good as Roger, likeable and despicable in turns, but trying his best even though he'll probably never get it quite right. The rest of the cast is also superb, even though they rarely say a word. And in addition to solid themes and fine acting, writer-director Mariage creates a visual work of art with carefully composed shots that look absolutely fantastic and allow plenty of room for the ideas and characters to breathe. Lovely little film. Winner: Best First Film (Montreal 99) , Audience Award (Beaujolais 99), Best Actor Poelvoorde (Chicago 99), Belgian Actor of the Year Poelvoorde (Ghent 99).